The debut vintage from Mataburro has arrived. These wines jumped out at us on a recent trip to France with their juiciness and sheer drinkability. Laurent Roger and Melissa Ingrand’s project is named for the railway line that runs just behind their vines. The first in the Perpignan region, on its opening day in 1910 two unfortunate donkeys were killed by trains. Mataburro means “donkey killer”. Laurent’s family were winemakers and his father farmed 40ha of vines before selling all but three in 2000. Laurent’s journey into natural wine started while working at La Verre Volé for few years. 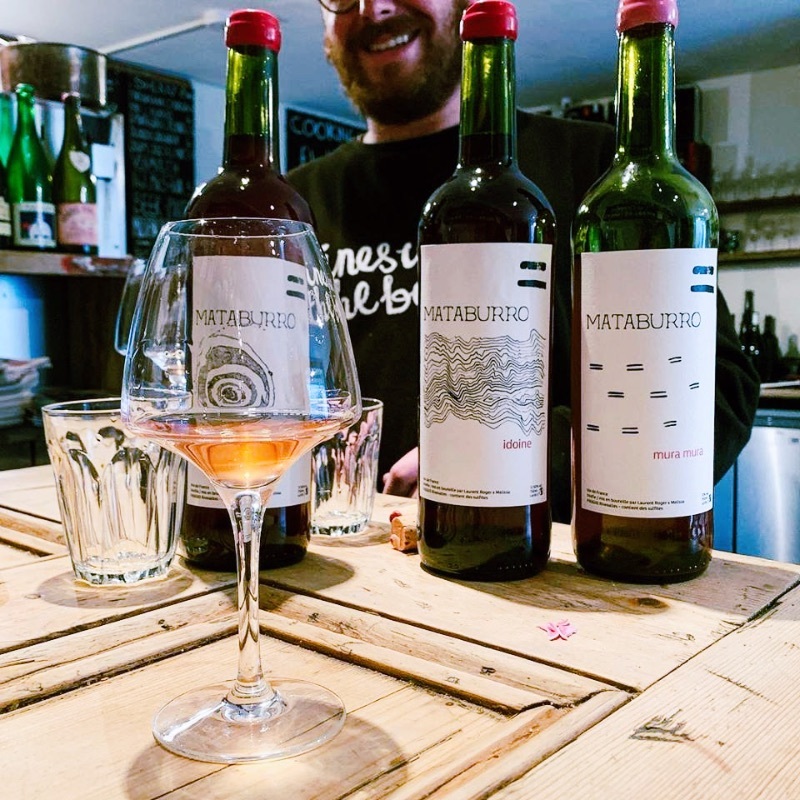 He decided to get his hands dirty and, after studies with Alain Castex of Le Casot des Mailloles, he and Melissa took over his father’s vines in October 2017. The three hectares are in one piece in Rivesaltes. Old Grenache vines planted by his grandfather in 1949 and young Merlot planted 30 years ago by his father. To have maximum soil life he does not plough, using green manure planting instead. Vineyards are worked organically with the only treatments used sulphur, copper and some essential oils. Winemaking uses native yeast with no fining or filtration. Soils are mostly clay on limestone with some galets roulés for the old Grenache vines and deep clays for the Merlot. Climate is Mediterranean with maritime influence. The wines retain great delicacy and freshness, the mark of Laurent’s teacher shining through. 100% Grenache, 80-year-old vines, eight-day whole-bunch maceration (semi-carbo), 20mg/l S02 on bottling. The name is from Latin and means leisure, retirement, time away from work and business to enjoy art, culture, or simply doing nothing. Bright and youthful, fresh acid, light body but intense cherry fruit. 80% Merlot, 30-year-old vines; 20% Grenache old vines 80 years; six days whole-bunch maceration (semi-carbo). Juicy, dry, pure, mineral, like fresh bright candy. 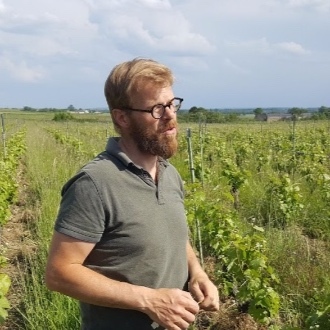 Our friends from Saumur all have something in common: They are connected through Phillippe Gourdon (Château Tour Grise) - a pioneer in biodynamic farming. After Phillippe retired they have started renting off bits of his vineyard to new, younger generation winemakers in an attempt to keep the blood flowing in Saumur. So, what's the story? Melanie Hunin, from Paris, and Aymeric Hillaire, from Saumur, established Domaine Melaric (a weaving of their names) in 2006 at the Chateau de Baugé, near the village of Puy-Notre-Dame. In 2008, they purchased four hectares of vineyards in Saumur Puy-Notre-Dame with advice from Philippe Gourdon. Laurent and Pauline (Domaine L'Austral) worked for one year as engineers in France but were not very happy stuck in front of a computer. They travelled and worked in Australia in different farms and in a winery on the west coast. Pauline then studied in Burgundy to become an enologist. During her first internship, Pauline worked with Melaric who introduced them to Françoise and Philippe Gourdon in Le Puy-Notre-Dame, who in turn had vines to lease. David Foubert (Domaine Folle Berthe), formerly a Parisien journalist, moved to Saumur for a life change and to study winemaking. Aymeric and Melanie have been a key influence; Melanie was David’s teacher at winemaking school, and David’s first vintage in 2014 was made in their cellar. David moved into his own – once-abandoned but now lovingly restored – cellar in 2015. He now farms a mix of parcels leased from Philippe. Phillippe's eight-hectare vineyard is made up of six hectares of Cabernet Franc and one each of Chenin Blanc and Pineau D’Aunis. It has been entirely biodynamic since 1998, a crucial status for Phillippe, who wants to create wines that express a true sense of their terroir. In the vineyard life flourishes; the grass remains long and wild all summer long; the vines remain untrimmed and are treated with various special herbal tea preparations of nettles, presses and willows to keep sickness at bay. The weather systems coming in off the Atlantic are forced upwards by the Mauges hills to the west of Anjou. 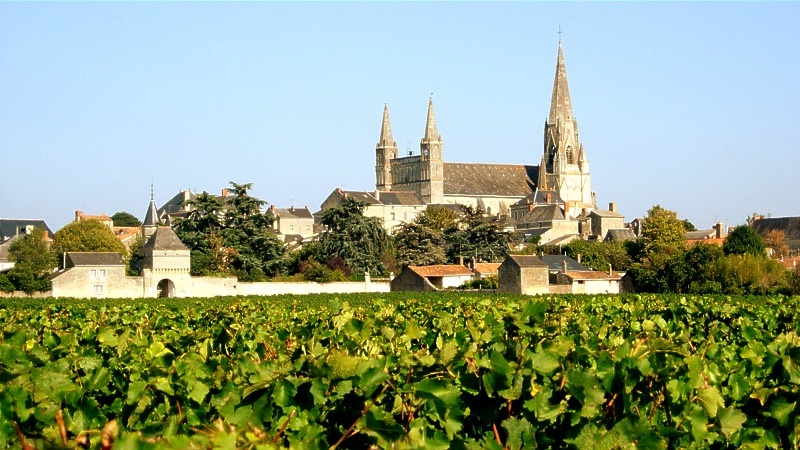 This causes a rain shadow which gives Saumur more of a continental climate. Le-Puy – being practically the most southerly point – averages less than 200mm/year. The elongated growing season this allows enables the wines to achieve ripeness. Some serious Chenin, soft balanced use of oak. Lean and tense. Powerful, intense and deep with a spicy, savoury edge to the concentrated raisin and marmalade flavours. Incredible concentration and notes of straw, herb and syrup. Bright, showing just a touch of development. Slightly more body than Pineau d'Aunis from more northerly vineyards, still with characteristic redcurrant fruit and a white pepper finish. Whole grape vatting. Alcoholic fermentation in indigenous yeasts, nine-month ageing in concrete eggs. Direct pressing, alcoholic fermentation in indigenous yeasts. Beginning of the alcoholic fermentation in the tank, finishing in the bottle. Direct pressing for half of the grapes and short maceration (about three hours) for the other half. This is what gives the intense colour and structure in the mouth. Alcoholic fermentation in indigenous yeasts, beginning of the alcoholic fermentation in vats, finishing in the bottle. Planted in 2002-03. Manual harvest, Destemmed. Maceration for 60 days – infusion only, indigenous yeasts, aged nine months in concrete eggs.